Since the dawn of Neopia, Blumaroos have been bouncing from land to land, spreading what is said to be "happiness" and "cheer". They operate from their home base, promptly called Roo Island, and provide joyous services such as the Merry Go Round and the Games Room. Yes, Blumaroos are perceived by Neopians globally as trustworthy and friendly. Yet, here I stand to deliver an important question to you: Do we really know what's ticking underneath? Here we have the ultimate tear-wrenching gambling sensation, known to drive avatar collectors to complete madness with no hope of returning. Dice-A-Roo. A game purely based on so called "luck". Dice-A-Roo was birthed by the mind of none other than King Roo, a jolly blue Blumaroo distinguished only by a cape and a crown. All you do is place a simple five neopoints into that friendly paw and just roll the dice. The objective of the game is to roll through five dice until the final dice rolls onto the jackpot token! Sounds easy enough, yes? WRONG. This twisted game has tormented many a Neopian for years. It's okay though, because whenever King Roo senses your despair, he'll send one of his many slaves friends to cheer you up with some encouraging words. Suspiciously, soon after the visit, you'll find yourself rolling into a Game Over! A Blumaroo consoles you by attempting to morph his features into what he thinks is a sad face. I can see behind that mask, though. In those cold, dead eyes, I see nothing but greed. That blue Blumaroo is so glad that you lost. He gets to keep your quickly growing neopoint stash (let's be real- you can't just walk away after one game) and hands over to you absolutely nothing. This isn't just gambling for your neopoints, though. Oh no, my poor children, Count Von Roo gambles for your pet's levels. That's right. This awful creature wants to weaken your poor pet. So, why would anyone even visit this dusty creep? Oh wow, I can't believe it! He offers an AVATAR!!!!!!! Yet again we stand before a Blumaroo taunting us with the chance of acquiring a shiny new avatar. All we offer in exchange are our neopoints and our pet's strength. When will this awful cycle ever end? Just saying, the not-so-friendly environment is probably why that guy gets no business. Alright, now this guy is just... wow. First of all, HE WORKS FOR DR. SLOTH!!! And if you thought the Garden Centre Blumaroo was creepy, wait until you get a full look at this guy. Commander Garoo has some mad moldy colored skin going on. Seriously, though. And those eyes are like staring into the darkest abyss in the darkest corner of Neopia. You know, I heard that his voice makes meepits cower in fear. The scariest thing is... no one knows where he's hiding now since Dr. Sloth's fall.. I have very reliable sources that have informed me of a certain *guest* taking refuge in King Roo's castle... Now, I'm not one to point fingers, but I'm just saying: Blumaroos tend to stick together. It's like some weird secret society. Once a roo, always a roo. There's has to be some reason why King Roo doesn't let anyone in that huge castle of his. Our hard earned neopoints went to building that thing! The least he could do is let us in for a look, am I right? Let me start off by saying I love Jazzmosis. You love Jazzmosis. We all cheer for Jazzmosis. Why, though? Why are we all soothed by the tunes of that sweet smooth jazz? I'll tell you why. It's that mysterious Blumaroo playing the melodic keyboard. I don't even know his name. No one does. In fact, no one knows any of the band members names. How can we know so little about such a popular music group? Yes, it's true. I am accusing Jazzmosis of earning their fan base not through easy-going jazz tunes, but through the use of faerie magic. That's right folks. If I were you, I would burn all Jazzmosis cds in possession and immediately discard any tickets you might be holding onto. It's not the jazz you feel massaging your soul, but that blasted faerie magic. I have done my best to alert you to the ulterior motives of these tail-hopping fiends. Blumaroos are greedy, conniving, and out to get you on their side. If you own a Blumaroo, I suggest pulling them aside and having a long chat with them about their true reasons for joining your family. Be careful what you hear in the media, as well. There are bound to be many who will step up to defend these Neopets, but I hope you will remember the evidence I have collected for you. 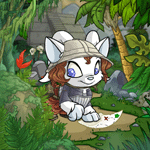 Stay strong, fellow Neopians, and may Coltzan shine his wisdom upon you. Over and out. DISCLAIMER: I don't have anything against Blumaroos. Seriously. Rohane is like, one of my top four favorite heroes from Neoquest II. Please don't abandon any Blumaroos in your care. I don't want to be responsible for that trauma.